This is a special climb and especially so if you take the straightest road from Aproz (484m). Soon after you get out on the nice road up to Haute-Nendaz you turn off on the road to Les Bioleys which starts with a sign warning of a … 50%!!!!! gradient coming up along this road. That is (as far as I know) the highest gradient ever noted on a road sign anywhere in the world. Luckily that is not quite true, as you would then likely not even would have been able to walk up there. This road is actually pretty fine for quite some time and just a normal mountain road for the area, but you will know that things will change. Suddenly it becomes clear where the steep part is and you can try going up a bit, but you will not likely really try and make it up there even if the steepest ramp is not so long. It is only a mere 35% or so steepeness, but interestingly it is indeed asphalted and not concrete as it normally would be. Then comes another little passage also likely to make you walk. 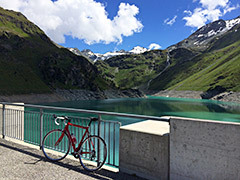 Apart from that short double-ramp section it is indeed possible to cycle the rest until Basse-Nendaz which is reached via a direct road at around 20% (you could take an alternative easier road here). Actually you likely will get up faster even when walking than taking the longer normal road, but it is probably around the same time. Then you should continue on a more direct road to Saclentse (I mistakenly took the main road here). This section should be unproblematic. Then there is a small road continuing past to Saclentse to the valley river which is gravel for a very short part, but nice and easy to use. Then turn right and now the next problem comes up. The road from here up to Planchouet is indeed asphalted, but narrow and following the river/waterfall straight and has similar gradients to waterfalls ;-). It is quite hard going with a road bike (39-28) and I had to give up on one of the many ramps well above 20%. There are two restaurants (and water) in tiny Planchouet. From Planchouet it is easy going (apart from flies) on the main road to the tiny ski resort of Siviez (1733m). There is then a small nice asphalt road continuing up toward the dam/lake of Cleuson. Continuous asphalt ends at 1850m, but there is some asphalt near the two short tunnels above 2100m. The gravel is mostly fine and not too steep, so quite possible and it is also nice up at the lake. The climb could also be started in Sion (490m) and climbed via Planchouet and although it is much easier than the straight road from Aproz, the damned ramps before Planchouet will still make it deserving of a 5 for difficulty. Other comments Quite clearly one could have avoided making the direct road up from Aproz be as steep as it is shortly, but that would mean using all the garden of the house placed just by the road here and likely that was not a popular idea (and probably they would not want a lot of traffic here anyway). An interesting climb, but one that will be very frustrating for most road bicyclists used to be able to force their way up nearly any road. But then there is the “easy” alternative up from Aproz too.